Create your own weatherproof Ethernet cabling with the high-quality modular TOUGHCable jack connectors, specifically designed for use with Ubiquiti TOUGHCable. A slot on each plug's shield is designed to accept the drain wire in all TOUGHCable cabling. 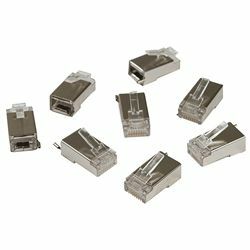 Designed to eliminate Ethernet ESD failures, the connectors install rapidly without soldering. Contains 100 pieces. Cable and crimp tool not included.